Sweetheart and I visited our son and granddaughters last week in Southern California. We had a great time sight seeing and laughing. I have a few travel posts, but I'll save them for another time. While I was putting all the tea cups away in the china cabinet after our kitchen update. (that's another post), I did a little angel and tea cup vignette on my vanity in my guest room. Go Here. I found this lovely vase at my favorite thrift store. When I'm out looking for new tea cups I seen to be drawn to pink tea cups. This was my mother's favorite rosary and the gold jewelry box was a gift from my sweetheart on our First Christmas, as newlyweds. I love my new-old candelabra. I also found it at my favorite store. The roses are called 'Secret' and they are a wonderful bloomer. I had a lace shawl and I draped it over the mirror for a romantic look. More of my pink tea cups. And Angels. I thought a little break from Pumpkins and Pilgrims would be nice today. Very beautiful and romantic. Love the floral tea cups. Pink florals on your cups created a wonderful vision. Along with the golden angel was also a perfect fit. 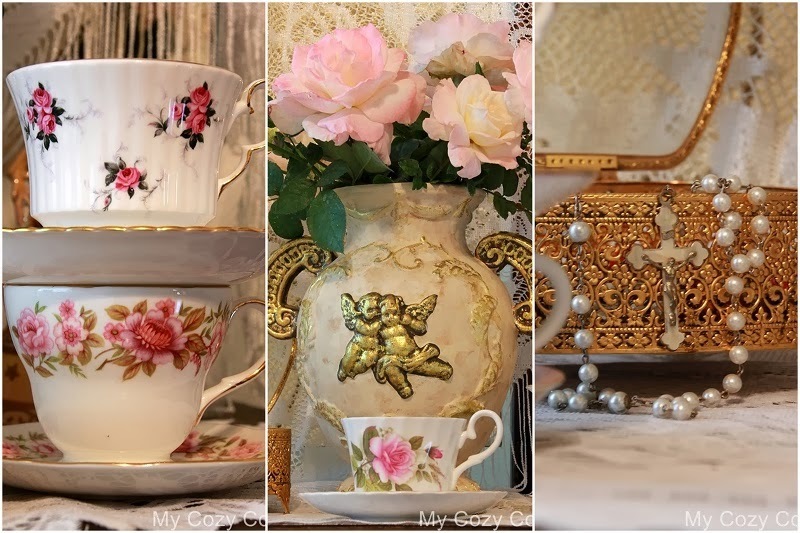 You have created a romantic tablescape with tea, lace, roses and angels. I agree so beautiful and romantic. Love the pretty pink cups. Your vignette is very romantic, Betty. I do love lace and teacups and I'm always drawn to the pink ones too. Roses are gorgeous too. Thank you for sharing at Tea Time and have a beautiful week. Absolutely gorgeous - my fav teacups are pink too! Your mother's rosary looks like my mom's too - I have it as well, very special to me too. Your candelabra is unique and sure sets a pretty picture. Beautiful vignettes! So many pretty treasures! Thankyou for sharing! Beautiful vignette! Love teacups, and lace. That's one of my fave colors and like you, I always attracted to a pinky thing-y. Very pretty! It's difficult to find fault with pink teacups! Betty, this is so very elegant. Pink tea cups have a way of drawing one in. lol! I love how you have them stacked! So pretty with the lace and gold chest. Thanks for sharing with SYC. And thank you for putting our Creating Christmas button on your sidebar. You will be included in the give away. I'll be announcing it soon. Such lovely pinks! The teacups are just wonderful. You have some very pretty treasures.